Poseidon was know for his unstable, mercurial temper. He could be completely affable one moment, enraged and aggressive the next. Sometimes he was extremely considerate and welcoming, only to suddenly become vindictive. In short, he was not someone that could be trusted to be reasonable. Poseidon's nature was mirrored by his domain, and he was prayed to by sailors and fishermen. 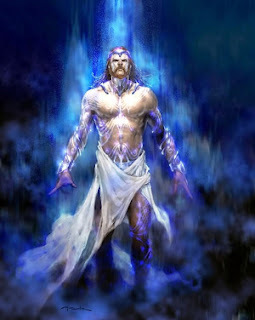 He was sought for both his blessing and as precaution, for it was easy to anger Poseidon. There were many dangers in the water, and the God could be merciless. Still, Poseidon didn't usually care much about mortals. He was more than willing to leave them to their own devices. There was one exception, though: Poseidon was taken with the ladies. He was as much a philanderer as his brother Zeus; he had countless affairs with just about anything that he liked. Fortunately for Poseidon, however, his wife Amphitrite was much more forgiving than Hera, and she didn't cause any problems for Poseidon. With his wife, Poseidon had two noteworthy children, a girl (Rhode) and a boy (Triton), as well as countless others, the Water Nymphs. Most of them stayed beneath the waves, in Poseidon's undersea palace. He also had a number of children with human women and most of them became heroes. Of them, Theseus is the most well-known, and Poseidon took an active interest in protecting him. For instance, he ensured that the boy received proper weapons and armor and made certain he received warrior training. When Theseus was in trouble on the ocean, he prayed to Poseidon, who calmed the waves and tamed the winds for his son. Some of Poseidon's children were monsters. He once decided that he'd try his luck with the Goddess Demeter. Demeter, being his sister, and knowing Poseidon's nature all too well, wasn't interested at all. But he wouldn't be dissuaded. Finally, she turned herself into a mare and hid in a herd of horses. Poseidon, though, was not one to be denied easily. He saw though her disguise and turned himself into a stallion. Their child was horse, Arion, that had human reasoning and speech. Poseidon was always fascinated with horses, and they were his special animal. In many poems, the white-capped waves going into shore have been compared with white-maned horses. His chariot was pulled by hippocampus: creatures with the bodies of a horse and the tail of a fish. Poseidon would give special horses to those that pleased him, and it was considered a great honor to receive such prestigious gift.